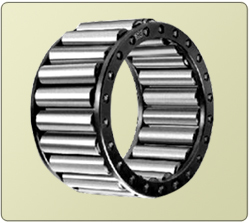 JMC Roller Cage Bearing with no inner and outer races are unique in design and versatile in application. 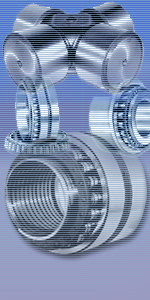 The rollers running directly between the shaft and housing secure an appreciable saving in bearing size and weight. With the elimination of races the assembly is so simple that the roller cage slides between the shaft and housing easily, and runs firmly and freely. This phenomenon is achieved by the precision in the manufacture of Roller and their disposition in the cage. The liberal length of the rollers, their quantity in each assembly and their disposition increase the capacity of the bearing to carry heavy load and withstand shocks and misuse. JMC Roller Cage Bearing guarantees minimum frictional resistance, easy mounting, heavy load and smooth running. The rolling elements are machined out of special case hardening steel, heat - treated, to give a hard case, so as to withstand wear and tear, and a tough core to avoid breakage. High accuracy and smooth finish obtained in centreless grinding operation ensures long trouble - free running. The two end rings, made of medium carbon steel, located and held Parallel by a set of space bars form the cage. This plays a vital part in dispositioning the rollers for a smooth, silent, trouble - free continuous running. Unlike bush - bearing, ample space is left between the rolling elements for entry and supply of lubrication.